The grassing of the south-west side of the site is the final stage of the Pallet Pavilion’s deconstruction and the first stage of new projects by Gap Filler and by others here. The Commons is a project that aims to be greater than the sum of its parts. To do that, it needs your input and involvement. Lots of people were part of our Pallet Pavilion community. We want to invite you back here but also invite new people here, too. So! Join folk from The Commons – Gap Filler, Life in Vacant Spaces, Makercrate, the Arcades and the Food Collective – next Saturday, September 6 for some grass rolling action! 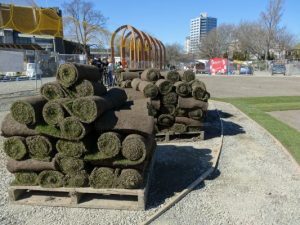 From 12:30pm we’ll be rolling out Ready Lawn on site and would love to make this a great community event. At 5pm we invite you to a Picnic on the (freshly-laid) Green for all grass-layers. There’ll be tasty food, drinks and also some music. We invite you to bring your own watering can along too as once the lawn is laid, it will have its first watering with water that we’ll draw from the nearby Avon River/Ōtākaro). It’ll be a great day, so please sign up to lend a hand and help us make this space a great place for our city. Saturday 6th September 2014 (WEATHER DEPENDENT. Confirmation on Weds 3rd September, check our website or Facebook page for details. 2 Sessions: 12:30pm and 2:30pm. Please arrive on time for sign in, briefing. Then we’re ready to roll.